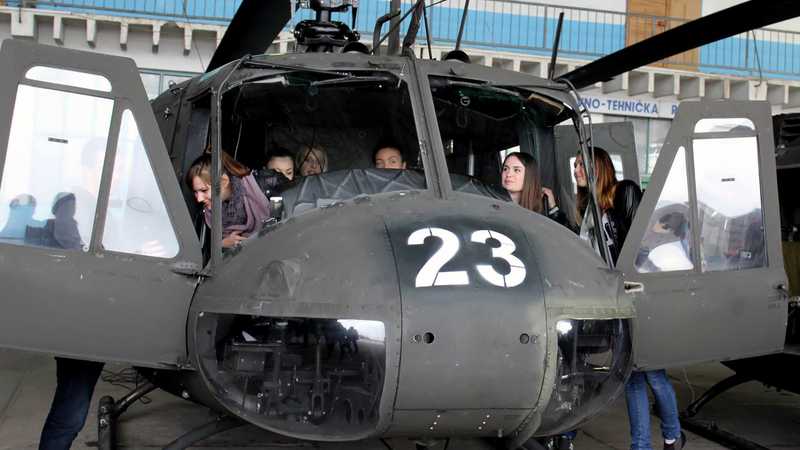 Students at a helicopter squadron, Rajlovac Army Barracks, Sarajevo, 18 October 2016. The majority of young people in Bosnia and Herzegovina (BiH) – those aged between 15 and 35 – perceive their role and personal engagement as weak and insufficient to have an effect on security-related processes. This was the finding of a survey conducted by the Center for International and Security Studies from Banja Luka last year. Some estimate that the youth unemployment rate in BiH is as high as 63%, an alarming figure that makes researchers wonder whether the lack of socio-economic prospects could explain the youth’s indifference towards security institutions. These findings, as well as other considerations related to domestic security, were discussed with more than 40 students of law, security, sociology and political science from both public and private universities in BiH at the OSCE’s second annual Youth and Security School. The Youth and Security School aims to improve the knowledge and capacity of future leaders about the Security Policy of BiH, a crucial document that covers all segments of national security and provides guidelines for a unified action of defence and security system. The programme also encourages students to contribute to development of solutions to security issues through constructive dialogue, cross-entity co-operation, and networking. “This is the first time that students have the possibility to become familiar not only with the Security Policy but also with how the security and defence institutions function in BiH, and to discuss the global challenges, such as terrorism, cyber terrorism and violent extremism,” says Sanja Fitzgerald, National Project Officer at the OSCE’s Security Co-operation Unit. Some of the leading experts explained the intricacies of the BiH security system comprised of dozens of ministries of internal affairs and law enforcement agencies that span over three distinct layers of government: state level, entity level (Federation of BiH and Republika Srpska), Brcko District, and 10 cantons in the Federation of BiH. Leading experts who delivered lectures included: BiH Armed Forces Brigadier Mersida Mesetovic, Deputy Minister of Security Mijo Kresic, Counter-Terrorism Adviser to Security Minister Mario Janecek, Head of NATO Division at the Ministry of Foreign Affairs Momir Brajic, Deputy Director of the Agency for the Prevention of Corruption and Coordination of the Fight Against Corruption Dragan Slipac, professors Milos Solaja, Vladica Babic, Hamza Visca and Muhamed Jusic. There is a certain degree of overlap in competencies between the different ministries and police bodies that exist in BiH. 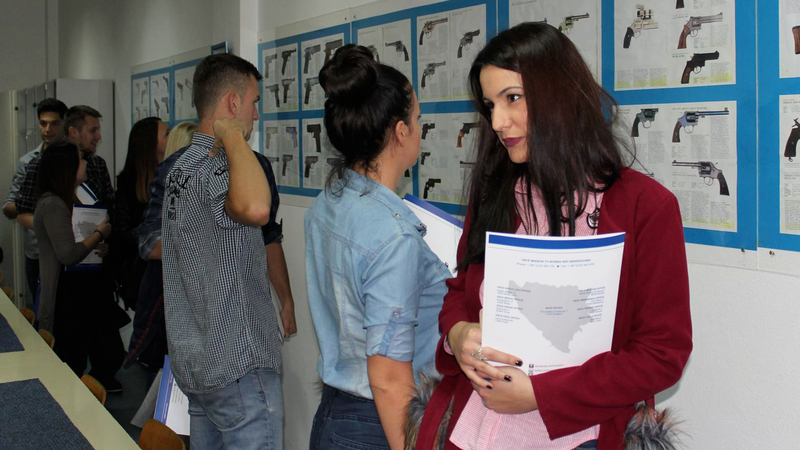 “The Security Policy is a complex matter that calls for a multidimensional approach to problem solving, particularly because of the divided competencies among the cantons, entities and state,” says Natasa Bilic, student at the Faculty of Law in Zenica. The students are given an opportunity to take an active part in the making of the new security policy since the recommendations defined during the School will be presented to the BiH Council of Ministers’ Inter-Ministerial Working on Monitoring of the Implementation of BiH Security Policy, a partner in the project. 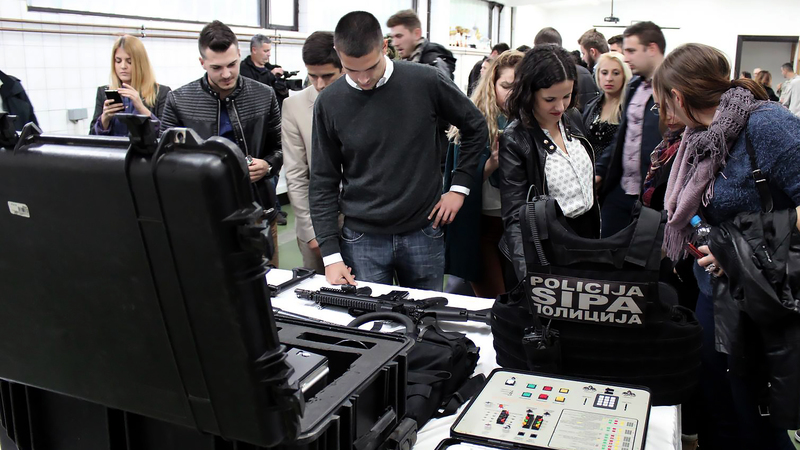 Students learning about the role and operational activities of the State Investigation and Protection Agency, Sarajevo, 18 October 2016. Member of the Air Force and Anti-Air Defence Brigade, greeting students at the Rajlovac Army Barracks, Sarajevo, 18 October 2016. 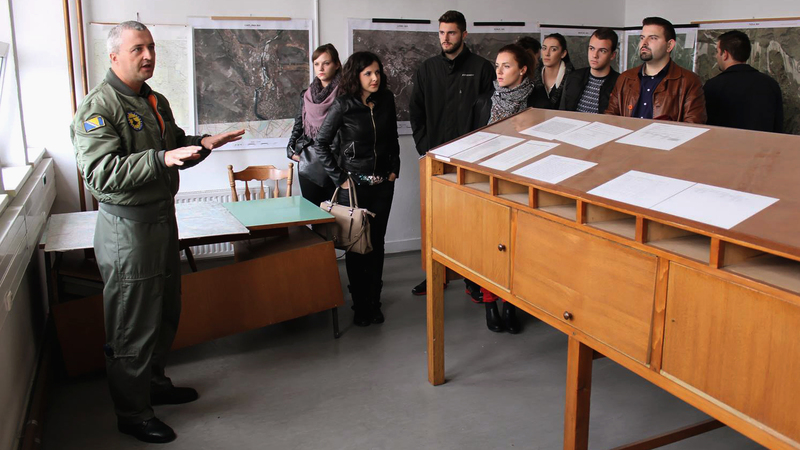 Students of the OSCE Youth and Security School, visiting the College of Internal Affairs of Republika Srpska, Banja Luka, 17 October 2016. 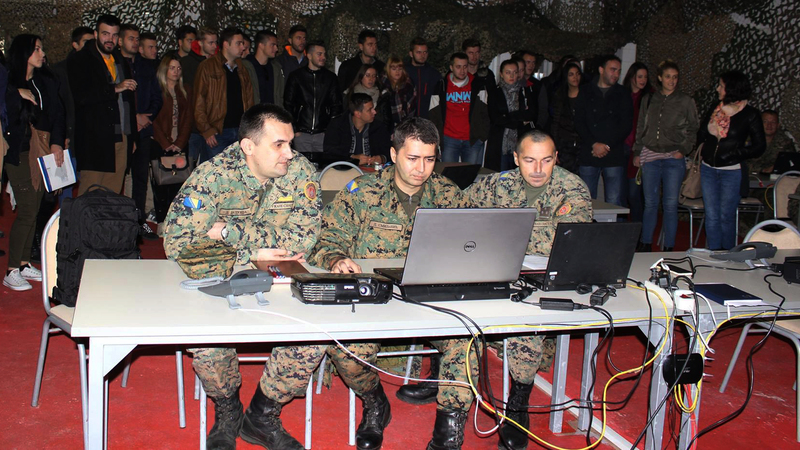 Members of Bosnia and Herzegovina's Army, presenting the work of army forces to students at the Kozara Army Barracks, Banja Luka, 17 October 2016. Meeting different government officials and civil servants exposed the students to an abundance of practical knowledge that goes beyond textbook theories. “We now have a completely different perception of how the entire security system works,” says law student, Ana Jankovic of the University of Bihac. The role of youth in addressing the constantly evolving security challenges and threats is critical. It is important for the students, as future decision-makers, to continue on this path of co-operation. This will help them find common ground to issues that will surely come.